A pint of milk, a loaf of bread & a blow dry? My local Tesco has been getting a makeover it's been an utter headache to shop there in recent weeks. I've been avoiding the place like the plague but I set out at the weekend to do my grocery shopping, vouchers in hand. I discovered the store now has a Beauty Hall and Blow Dry Bar. It's all rather swish and wouldn't look out of place at M&S or Debenhams. As a natural free from beauty blogger I was excited to see Tisserand and Australian Organics. Other brands that do not float my boat but may yours are Kings & Queens, Steam Cream, Olivello, Natio, Diego Dalla Palma and Rose & Co.
My heart rate increased when I spotted a sign for "Natio - Natural Australian Beauty". My excitement was short lived and I found myself muttering under my breath like a crazy person. This brand is full of parabens, silicones and who knows what else. HNZ (Honey New Zealand) looks a little better promising to be free from parabens, SLS, harsh preservatives and cruelty free. 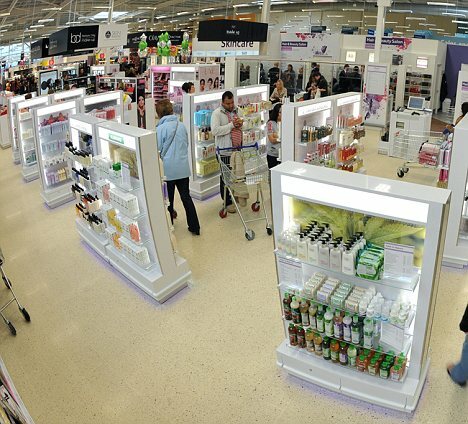 So what do you think of Tesco branching out with a Beauty Hall? I am unsure how many stores this is being introduced into. From what I have read it was launched up North last year. I am interested to see whether brands will come and go depending on demand. My Tesco has been like this since I moved to the North West, the beauty part is amazing, there are lots of veggie brands that don't test on animals! Wow that's turning a bit posh looking for a Tesco! One of the Tesco near me is like this too. It's huge with a massive beauty department, clothes department and even a health food shop! It's actually a bit over whelming! It's certainly an interesting concept, I'm not the biggest fan of any supermarket I have to shop at several to get my free from food. Oooo looks good will be going to have a look this week! A health food part would be amazing! Excuse me while I browse through months of older blog posts (i've been busy with life and uni). Anyways, Natio is one of my most hated brands because it's so popular over here but full of nasties. It's unfortunate that it's so misleading. I do however have a couple of their natural perfumes because they're really cheap and the scents are made from natural oils - unfortunately the natural perfume market isn't a big one so my choices are limited. Interestingly, i've never heard of Australian Organics before. i'll have to look into them. I did wonder where you had disappeared to :) I bet Australian Organics isn't even Australian lol. I'd be interested to know what you find out.